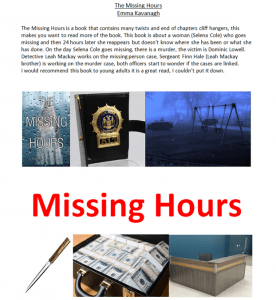 The Missing Hours is a book that contains many twists and end of chapters cliff hangers, this makes you want to read more of the book. This book is about a woman (Selena Cole) who goes missing and then 24 hours later she reappears but doesn’t know where she has been or what she has done. On the day Selena Cole goes missing, there is a murder, the victim is Dominic Lowell. Detective Leah Mackay works on the missing person case, Sergeant Finn Hale (Leah Mackay brother) is working on the murder case, both officers start to wonder if the cases are linked. I would recommend this book to young adults it is a great read, I couldn’t put it down. This is a great review Molly – it makes me want to read the story:) And I like your montage of pictures – it really gives an impression of what it’s about.